Description of "Buy Right Property from Right Person (eBook)"
We try to invest our saved money in various options. Investment of our savings in a property may be one of them. It may be a piece of land or a flat or an independent house an office premises. Subsequent to investment, if we learn that the person who sold the property had no marketable title in his favor or that a litigated property was sold to us, our investment will be at stake. We have to be prudent and diligent while investing money into property. The Law always comes to the rescue of diligent, but not dormant. The book enlightens the readers on various aspects of buying process. The author is a practicing Lawyer since 1993 and author of few titles for both laymen and lawmen. 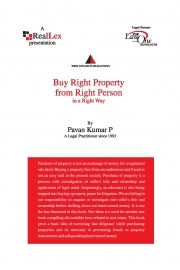 Reviews of "Buy Right Property from Right Person (eBook)"